No other band on Blue Rose has ever taken a break this long! After many months of rumors, followed by clues and pieces of information distributed by mastermind Dave Kincaid, their loyal fans‘ dreams finally come true. 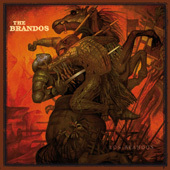 After ten a half years The Brandos are back with a brand new studio album. Los Brandos is released just in time for their current tour of Europe. Truly, Los Brandos is the next great comeback of this New York-based band that is the embodiment of terms like „street credibility“, „old school rock’n’roll“ and „handmade electric guitar rock“. Since their debut album Honor Among Thieves (1987) The Brandos have been delivering no-frills rock’n’roll dominated by crunchy guitars and a barnstorming raspy voice – a captivating mix of CCR, 60ies garage rock ethos, American roots with healthy doses of Irish folk and Latino border rock. Dave Kincaid is the band’s creative center and founding member, his band members fluctuate but since some of them eventually come back, there is a pool of Brandos musicians he keeps drawing from. But, clearly, Kincaid is the band’s undisputed leader, songwriter, guitarist, multi-instrumentalist, producer and the guy with the band’s amazing trademark voice. He has been working on Los Brandos for years and played 90 percent of the album’s guitar, bass, mandolin, keyboard and percussion parts himself in his Staten Island home studio. The analog-sounding final mix was concocted by Don Sternecker, known for his work with the Feelies, Neal Casal, Silos, Richard Barone and many others. He also worked on a number of previous Brandos albums including 2006’s Over The Border. Tommy Goss (who played on some songs of 1998’s Nowhere Zone) played drums. Guitarist Frank Giordano was a steady band member from ’96 to ’99 and added some parts to Los Brandos. Goss and Giordano will tour alongside Kincaid in a quartet completed by bassist Sal Maida (Cracker, Roxy Music, Sparks etc.). Named after Marlon Brando’s famous movie „The Wild One“, the NYC-based band tumbled into turbulent times after the success of their first album Honor Among Thieves: Major label shenanigans, management trouble, personnel changes and a second album that was finished and then scrapped … it was almost a miracle when they reappeared in 1992 with Gunfire At Midnight. A successive string of albums – The Light Of The Day (94), Pass The Hat (96) and Nowhere Zone (98) – and regular tours including a Loreley show for German TV show Rockpalast cemented their status as a powerful rock band with something special. But they mainly focused on Europe in those years and slipped below the radar in the US. In 2006 the Brandos joined Blue Rose Records and celebrated a successful comeback after an eight-year hiatus with Over The Border, a scorcher of an album with plenty of rocking Kincaid songs, some unexpected 60ies covers, some Irish folk and two border songs that foreshadowed the band’s future course – the opening title track and a surprise acoustic cover of „Guantanamera“ as the album closer. „Over the border“ is the leitmotif for the new album Los Brandos! Latin American culture and the Spanish language have become a well of inspiration for Dave Kincaid. Five of the album’s ten songs are sung in Spanish (English lyric translations included) which brings out unexpected facets of Kincaid’s voice. In order to avoid misperceptions, though, the Brandos start proceedings with two rockers! „Señor Coyote“ is the story of a contemptuous human trafficker who takes a lot of money for illegally bringing Mexicans into the US under terrible conditions. Is he „a demon of hell or the angel of my salvation?“ is the refugee’s question. ‚Querer A Los Niños‘ is dedicated to all children who are suffering from physical or psychological abuse in their own family. „Suffer In Silence“ is the first of five English-language songs, a panorama-sound guitar rock number, ready-made to become a a radio or festival hit. The well-structured semi-acoustic ballad „Woodstock Guitar“ delivers a smart storyline that stretches from the legendary 1969 festival via Van Morrison, Bob Dylan and The Band to today’s vibrant scene – from a delicate acoustic intro to fiery guitar salvos and pounding drums. It is contrasted by ‚Jacinto Chiclana‘, a melodic, romantic love song written by Tango great Astor Piazzolla. It’s a beautiful duet between honey-voiced Marta Gomez and Kincaid accompanied by keyboards and Spanish guitars. The glistening guitar rock of ‚Maligna Presencia‘ is a classic, guitar-driven Brandos song – sung in Spanish. This song features a Tito & Tarantula vibe, ready-made for a Tarantino movie. „What Kind Of World“ is sparse acoustic folk in a melancholy solo performance by Dave Kincaid. ‚Bella Encantadora‘ is a moderately-paced melodic song with beautifully layered guitars, a strong hook and an exquisite guitar solo. The raucous rocker „These Troubled Times“ comes closest in sound to Brandos classics like „Gunfire At Midnight“ and „Gettysburg“ with Kincaid’s rasp spitting out his angry lyrics about the desolate state of the world. But, alas, there’s hope: „These troubled times won’t bring us down, won’t make us blind.“ The album closes on an upbeat note with a good time cover of ‚A Todo Dar‘, a 1955 Latino hit for Pedro Infante, written by Ignacio Jaime, performed as high speed garage punk. Kommentare deaktiviert für Hardly to believe but they finally made it – THE BRANDOS are back with the new studio album Los Brandos!